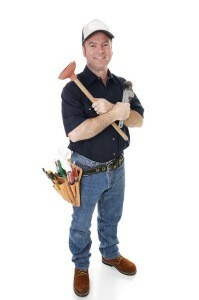 For a Plumbing Emergency, Don’t Dial 911, Call the Plumbers! Friendly plumber with his tools. Full body isolated on white. A sump pump is a device that is designed to pump out water from the lowest section of the home basement. They may be necessary for homes with wet basement problems, or in low-lying down river areas where water tables are high. For homes in an area where flooded basements are a major concern, industry sources suggest additional measures be undertaken. These may include having patios, outdoor pools, or slabs re-leveled to direct water away from the house foundation. Installing or repairing gutters to accomplish the same is also suggested. Having an additional sump pump installed with a battery backup would serve in emergent situations such as power outages or mechanical failure of the primary sump pump. Homes in areas where there is concern for water table levels, sump pumps help keep the foundation intact. Sump pumps help with the overall cleanliness of the home. They minimize or eliminate mold, rot, rust, and unhealthy air occurring in the home. Sump pumps help keep insect or termite infestation at bay. Sump pumps may help protect wall coverings or paint from peeling. Sump pumps keep any metal appliances rust and/or corrosion-free. As a result of minimal dampness, the overall climate in the basement remains more stable. Some resources recommend the purchase of a sump pump if found to be absolutely necessary. If measures can be taken to divert water-flow toward the foundation, implementation of such may address occurrence of basement flooding. One can purchase a sump pump through independent retailers, waterproofing contractors, or plumbing wholesalers. They range in price from $60.00 to over $500.00. Noted, is most sump pump manufacturers offer a limited one-year warranty. The two types of sump pumps are submersible, or pedestal. The pedestal pumps have a longer life span, but the submersible pumps can be installed underneath the floor with an air-tight lid, provided the sump basin permits installation. It is strongly suggested to purchase a sump pump with a cast iron core over plastic. Test regularly to Ensure proper working of the check valve so water does not return to the basement. During periods of inactivity, occasionally dump a few gallons of water into the pump to ensure proper functioning. Contact a professional if necessary or for peace of mind from their expertise.